saucepan over low heat; add vanilla. chill 10 minutes or until firm. chocolate mixture at room temperature. Melt white confectioners' coating with remaining sweetened condensed milk in heavy saucepan over low heat (mixture will be thick). Add peppermint extract and food coloring, if desired. Remove from pan by lifting edges of wax paper; peel off paper. Yield: About 1 3/4 pounds. Oh I want these now!! 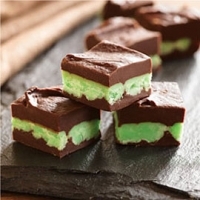 Love chocolate n mint. I pretty Cool Fudge recipe. Oh dear. I have to go to the dentist after just looking at that yummy photo. Erin Go Braugh!